Mid century modern front doors can really improve your mid century home’s curb appeal — and we’ve found 13 places where you can find them. Our list includes doors made of wood, fiberglass, and steel. And, we have three DIY options to consider, too. We first spotlighted Simpson Doors when reader Doug tipped us to their midcentury Early American (aka “Cool-onial”) style doors. Several months later, reader Mitch saw that the company also had 9 mid century modern front door styles tucked in their catalog. 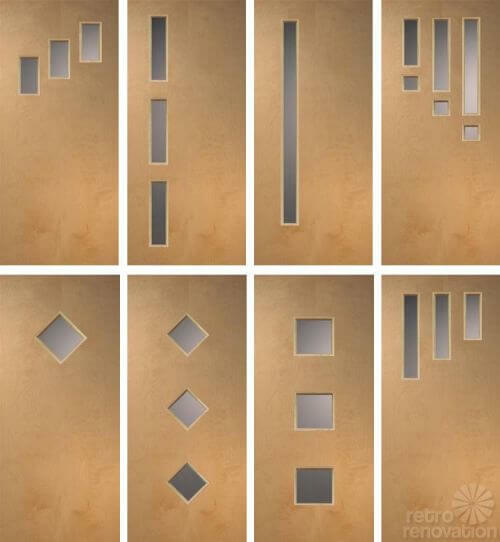 All of the mid century door styles Simpson Doors offers are made of wood in the USA and can be custom ordered in a variety of sizes, wood species and glass styles. 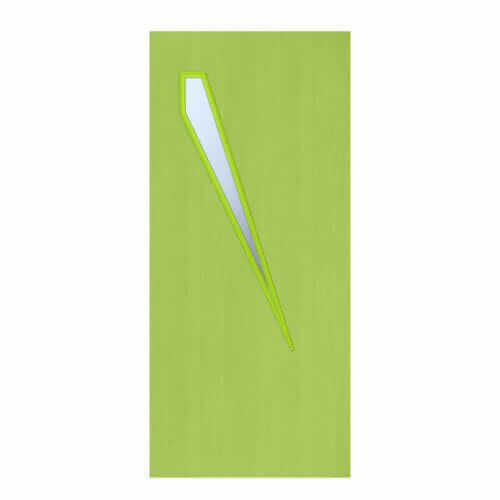 The company also offers many helpful tools such as their door test drive tool and glass taste test and per a comment from reader Kristine this Contemporary Flush door design tool. 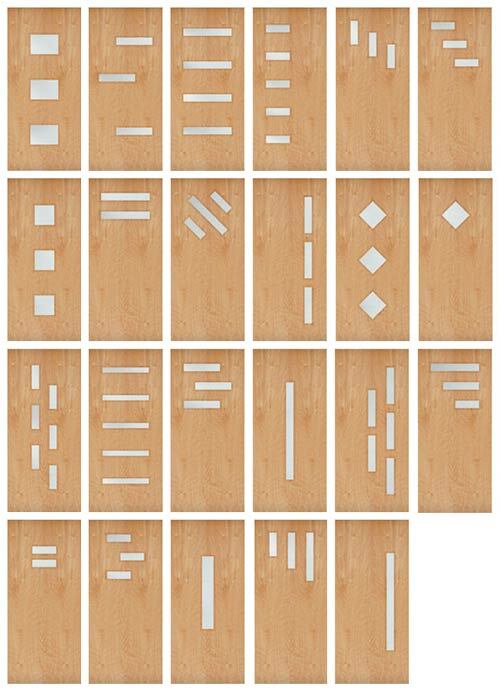 Frank Lumber has been in business in the Pacific Northwest since 1948 — and they stock eight models of solid birch wood doors, with many available options for customization in different wood species, glass and sizes. The doors themselves are made just up the road in Marysville, Washington, by Kylemont Custom Wood Doors, their partner company. Frank Lumber also prides themselves in giving expert customer service and advice for your door project — however if you are too far away to visit the shop in person, they will ship doors and have a handy how-to to help you measure for your new door. Rogue Valley Doors offers three styles of handcrafted, made in the USA mid century modern front doors from domestically manufactured components. According to reader Virginia, who tipped us off to this company, prices for Rogue Valley Doors are comparable to other companies we’ve featured — such as Frank Lumber and Simpson Doors. It was big news a few years ago when we discovered that the very first mass-market door manufacturer — Therma-Tru — had introduced a new line of midcentury modern style front entry doors. The doors are part of their “Pulse” line — which comes in a variety of styles with lite variations — and are available in oak grained fiberglass, smooth (paintable fiberglass) and steel. What a transformation! Scott added a Therma-Tru midcentury modern front door, along with some other period-appropriate features, and oh my word, what a difference! Getting a new door of any brand installed can be easy, or not so easy. We wrote about reader Barbra’s super easy experience with her new Therma-Tru midcentury modern front door installation, but also heard the long saga from reader Scott, who initially found it difficult to find someone to install a Therma-Tru door for him. 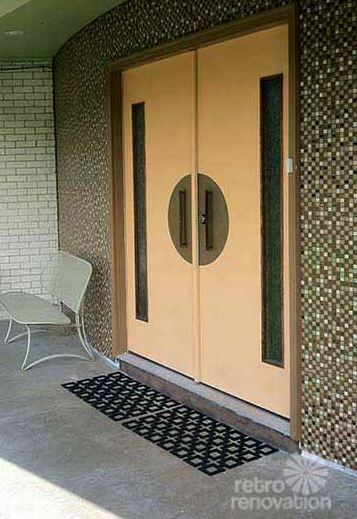 I’ve got another manufacturer who has mid century modern front doors: GlassCraft Door Company in Houston, TX. The dealer in Temple where I found these quoted me about $1600 for the 6’8″ Beverly door on p 123 of their catalog, about $300 less than their online price list, so maybe the dealer gets a discount? That’s prehung, with brickmold & hinges, and unfinished, with choice of glass. Doesn’t include installation or handle sets. 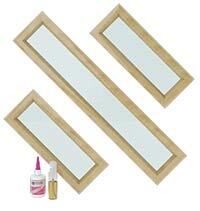 There are 8 factory finishes available (all wood tones), and 4 glass options. They show 377 dealers across the US. Not cheap, but maybe a good option for some folks. Escon Doors jumped on the mid century modern design revival in 2016. 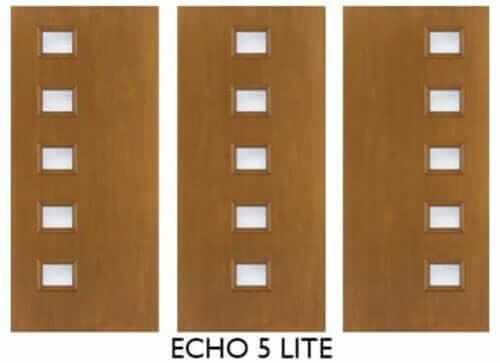 It offers 16 different designs, with the door lights varying in number, size, and direction. 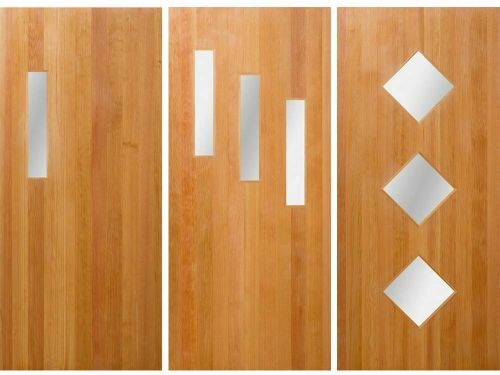 Like the Therma-Trus, Escon’s midcentury doors also are in fiberglass, which some homeowners prefer for climate reasons. And, they come with matching sidelight options — kind of cool! 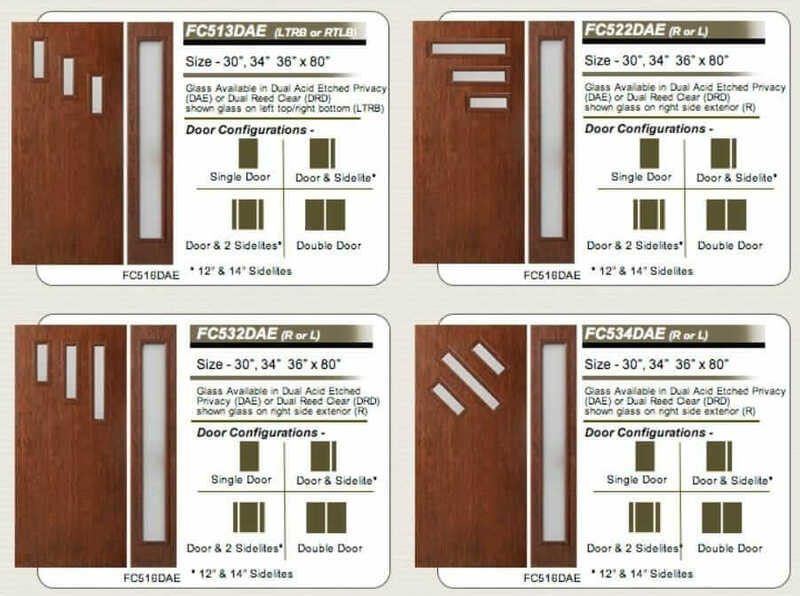 You can order three different styles of mid century modern front doors in fiberglass through Home Depot’s website. The doors are made by Builder’s Choice and are available pre-finished in a handful of colors — including candy-apple red and skylark blue. 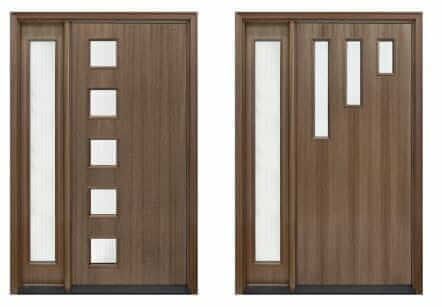 Depending on the chosen features, these doors retail for between $599-$959. Millwork Market is the newest competitor among manufacturers of mid century modern front doors, opening in June 2014. 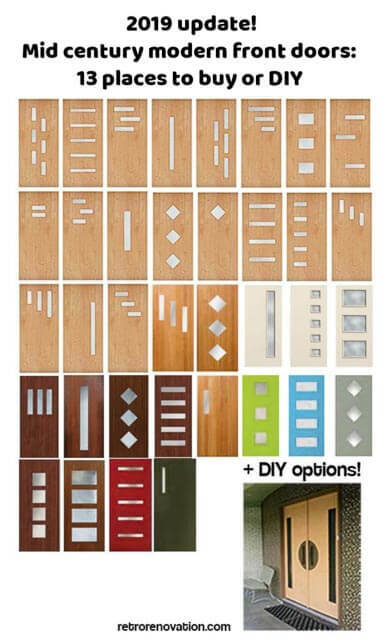 The company offers 21 styles of DIY Door Lite Kits. Based in Austin, Texas, the company manufactures all of their products in house. 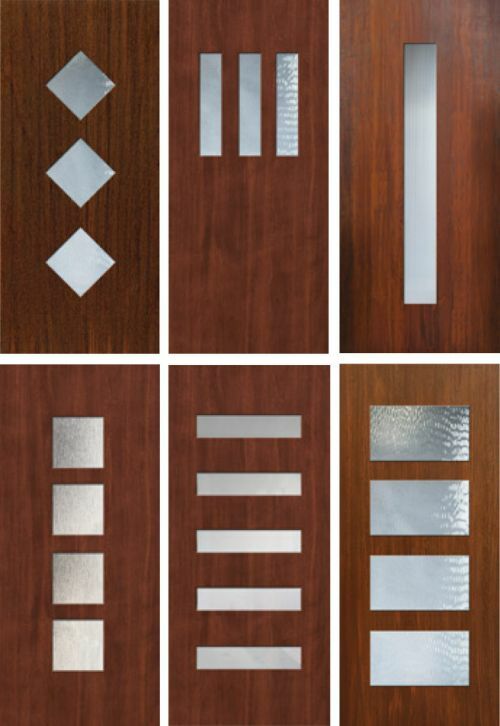 Make It Midcentury is the newest player in the market for door lite kits, and they have an expansive, super stylish set of offerings. Indeed, I count 69 — yes, 69! 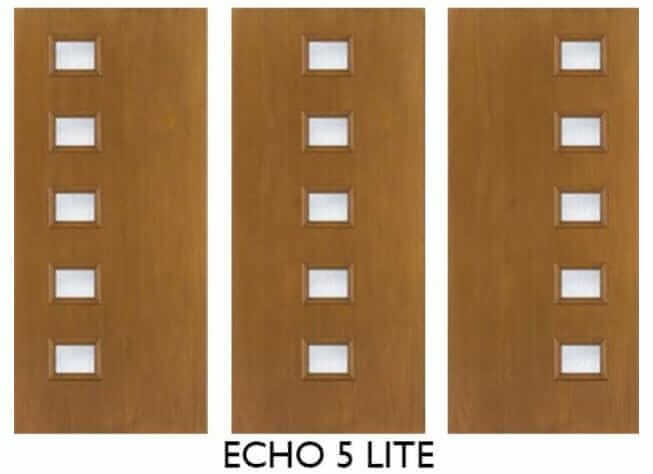 — different exterior door lite styles. If you are an individualist who wants a front door with next to zero chance of looking like anyone else’s in the neighborhood, this company and its options are for you! Emily tipped us to this company, but it took me a while to figure the company out. It makes door lites. Check the materials they are framed in — I think it’s fiberglass, but check. 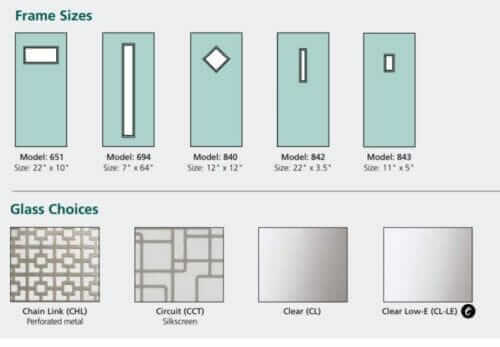 See the diagrams above — find a retailer, and you can order the door lights and install them yourself or have a contractor do it. 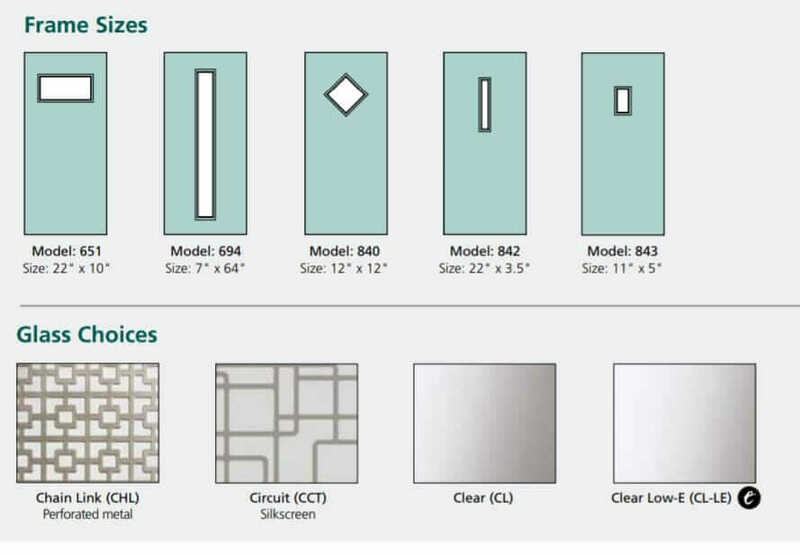 ODL 2019 catalog — go to “Spotlights” collection for the mid century modern sized door lights. Creative reader Sarah, with the help of a local glass shop, made her own midcentury door. Inventive reader Sarah — owner of the fabulous Gilbert Spindel designed round house — shared the steps she used to make her own mid century modern front doors using a plain wood slab door and her local glass shop. 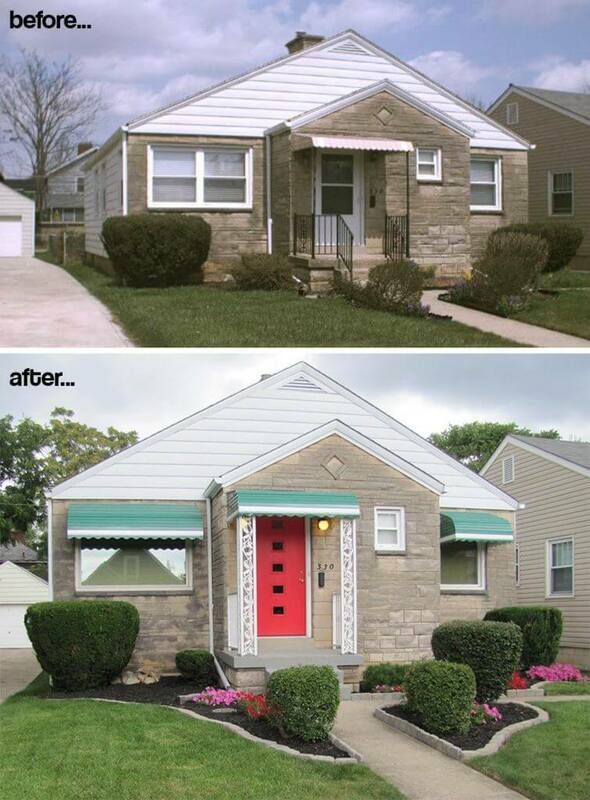 For just $30 — she did her own carpentry — Sarah was able to make the door above, a perfect complement to her 1964 home. Note: Get with your local building inspections department to ensure the glass and other materials you are using meet building codes. See more info below on what Therma-Tru told us about safety glass. 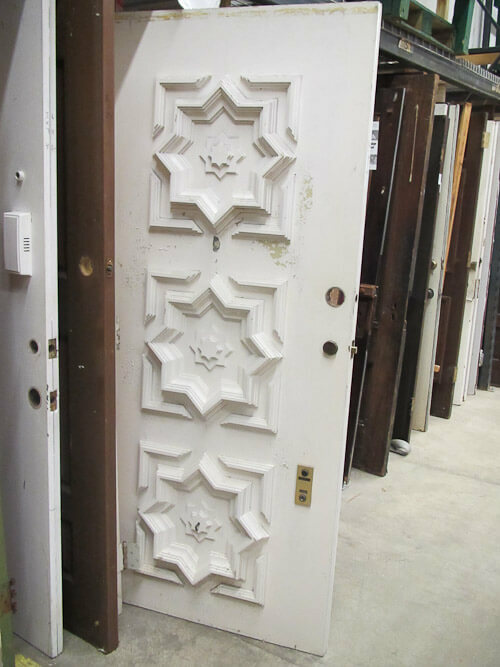 And of course: You can always seek out vintage, salvage midcentury front doors. I see them at my ReStore quite often, and as I recall, they typically cost $40 or less. Thing is, ya gotta get the fit right, and I am not an expert on issue related to current life safety codes (building codes, fire codes, etc.) — on this, do your own research — for example, see the info below from Therma-Tru about today’s requirements for safety glass. ….By federal law, safety glass must be used in doorlites and sidelites, no matter who the door manufacturer may be. This same law requires that each individual piece of glass must be clearly marked with a visible code number. This is generally called “the blaze” within our industry and is required as a federal safety regulation. Most manufacturers also choose to put their company name on each glass panel. 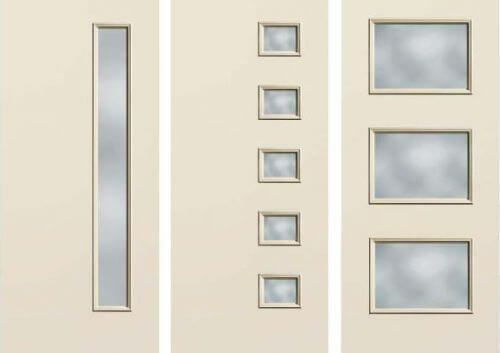 While this coding is not required on most windows, it is required on every individual piece of glass within a door and/or sidelite. When the glass is larger or has a decorative design, the blaze is not very visible. However, when the glass pieces are smaller and/or completely clear, the blaze does tend to stand out a bit, as Scott has experienced. We understand that Scott has replaced our glass, and we’d like to suggest that he make certain that the auto glass installed meets the federal safety regulations, both to comply with the laws and for his family’s safety. He can check on this with the person who supplied the glass, or look for the code numbers on each pane of glass. Finally, we want to thank Scott for his feedback. We are committed to providing the best product possible and appreciate his comments as we continue to look for ways to improve our products. So note, dear readers: It sound like, no matter where you buy a new door like this — no matter who the manufacturer — you’re going to get a watermark “blaze” on each pane of glass… although the manufacturer’s logo may or may not also be on there, depending on their practice. It’s great to see the growing number of options for front doors. Cuz, as they say, you only get one chance to make a good first impression! Note that, regarding this video, Crestview is no longer in business — but this video certainly shows how a snazzy midcentury modern front door can make a big difference to the look of the house. Do you want a retro door knob set to go with? Note: This post has been updated from the date of its first publication in July 2014. I replaced my old front door with a Therma Tru Pulse Echo three lite about a year ago. I don’t think I would’ve discovered these doors if it wasn’t for Retro Renovation! So…thank you very much! The cool mid century style looks great on my little 1950 cottage-y ranch. Interestingly, the retailers I worked with when I was researching this door insisted I needed a pre-hung door. My installer (my dad) insisted we did not, and neither of us wanted to tear into the door frame, exterior siding, etc. to install a pre-hung door. The clerk at a certain big box store actually told me I had no idea what I was doing and laughed at me, telling me there was no way that slab door would ever work out and I’d be sorry. Well guess what, we did know what we were talking about it and with a few little trim adjustments, it fit just fine! This door is great if you’re on a budget too as I believe the slab door only cost me around $350. Yes, I remember when the Therma-Tru story first came out. They were the first mass-manufacturer to do mid century modern front doors — so it was a big splash! I would say that the quality is good but the windows are not perfectly level, which drives me a little crazy because I obsess on straight lines, but probably no one else has noticed it. Although I absolutely recommend these doors, I do think you get what you pay for and some of the gorgeous wood options are likely overall nicer doors. I think it’s fabulous that there’s an affordable option out there for folks like me…mid century modest house, 21st century modest income, retro mid mod affordable doors…it’s all good! Do any of these companies do a dutch door in mid century flair? I know its not a traditional look for MCM, but I’d really like to have the ability to open it without the doggies getting out on nice days. When I was going thru all these companies again, I noticed some dutch doors. Not mid century modern — mid century modest/colonial/traditional. Timely update- I am going to Frank Lumber tomorrow morning to pay for my new MCM door and sidelight. Imagine the door with the three diamond shapes, above, in their listing with the diamond shapes off to the hinge side and the knob and deadbolt with a 5″ backset to accommodate the Rejuvenation Hardware MCM doorknob “star”. It’s going to be beautiful and I can’t wait to send in some pictures of the before and after! Wow! Yes, be sure to send me before and afters! Those MCM doors are beautiful, but a lot of them are unsafe. If you break the glass near the door knob, you can put your arm through and unlock the door from the inside. Again, I don’t normally want readers to advise on safety/environmental issues — readers should get with their own properly licensed professionals — but I will approve this one as another issue for readers to consider/assess/do their own research on. That’s part of the reason I decided to move my diamond shape windows over to the hinge side. For that matter, if somebody wants in there’s plenty of windows all around your house. 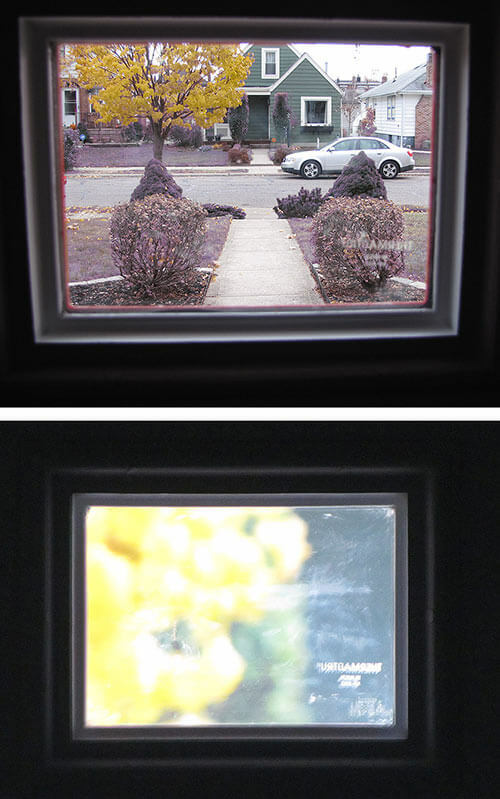 If you’re that concerned you could put wired glass or high strength safety glass in your door. Menard’s Mastercraft line has a 5 lite, 3 lite and a narrow offset full height single light. Primed and pre-hung they are about 50% less cost than Home Depot if you’re on a budget (buy you have to paint them). 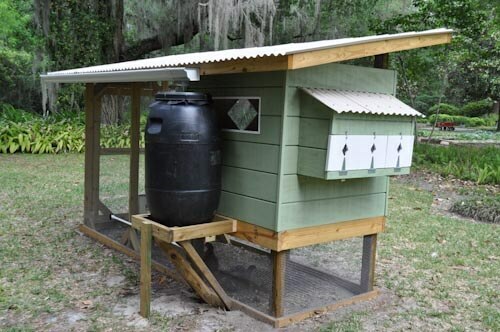 I have a 5 lite on a modern shed that was around $250. You can customize them a bit on their website too. Thank you, Fred — when I get a moment I will add this sto the list!